A car carrying Prince Charles and his wife was attacked during riots that continued in London as lawmakers passed a controversial plan to triple university tuition fees in England. A car carrying Prince Charles and his wife, Camilla, was attacked during riots that continued in London Thursday as lawmakers passed a controversial plan to triple university tuition fees in England. An Associated Press photographer saw demonstrators kick the royal couple's car on Regent Street, in the heart of London's shopping district. The car then drove off. 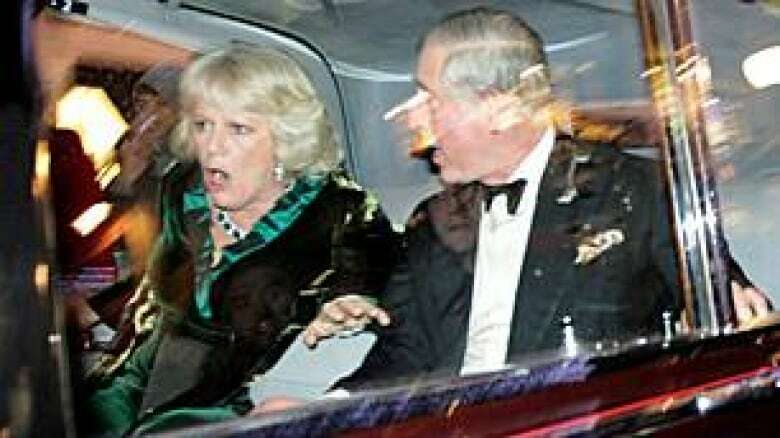 "We can confirm that the royal highnesses' car was attacked by protesters on their way to their engagement at the London Palladium this evening. The royal highnesses are unharmed," a statement from Prince Charles's press secretary said. The attack came after lawmakers approved a plan to raise the cap on tuition fees to £9,000 ($14,000) was approved 323-302, a small margin given the government's 84-seat majority. Many in the crowd booed when they heard the result of the vote. Thousands of students held demonstrations and sit-ins throughout the country. Students marched through central London, banging drums, waving placards and chanting "education is not for sale," as weeks of nationwide protests reached a crescendo. Throwing flares, billiards balls and paint bombs, small groups of protesters tore down barricades as police attempted to reinforce a security cordon near Parliament. Police said 16 protesters and six officers, including one pulled from a horse, were injured in the fracas. Seven people were arrested. 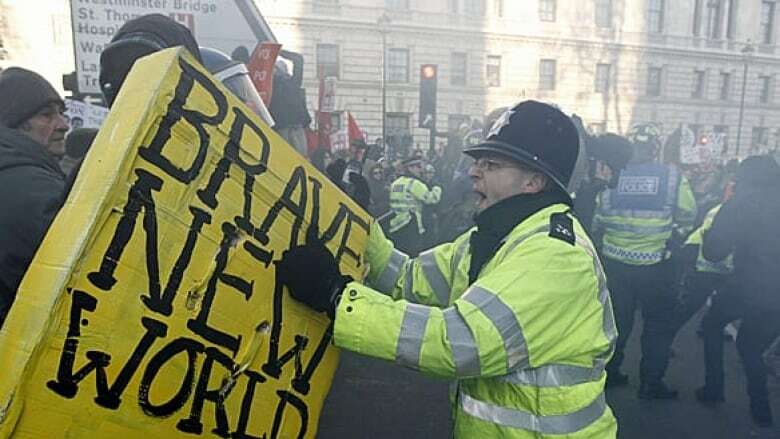 The scuffles broke out after students marched through central London and converged on the square, waving placards and chanting "education is not for sale," capping weeks of nationwide protests to pressure lawmakers to reverse course. The tuition vote posed a crucial test for both the Conservatives' governing coalition with the Liberal Democrats, and the government's austerity plans to reduce Britain's budget deficit. The vote put Deputy Prime Minister Nick Clegg and other Liberal Democrat leaders in an awkward spot. Liberal Democrats signed a pre-election pledge to oppose any such tuition hike, and they had reserved the right to abstain in the vote even though they are part of the governing coalition proposing the change. Those protesting in central London were particularly incensed by what seemed to be a broken pledge by Clegg's party. "I'm here because the Liberal Democrats broke their promise," said 19-year-old Kings College student Shivan David from Trafalgar Square. "I don't think education should be free but I do think that tripling fees doesn't make any sense. We are paying more for less." Inside the House of Commons and to jeers from the opposition lawmakers, Business Secretary Vince Cable insisted the new tuition plans were "progressive." 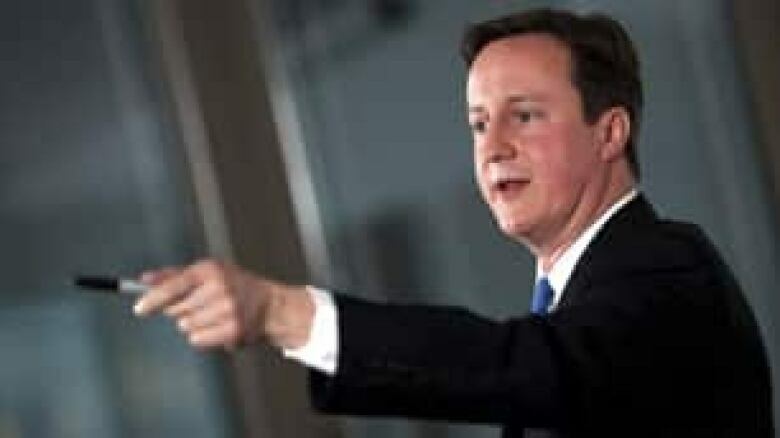 The tuition increase passed despite the opposition of some Liberal Democrats, and even a few members of Prime Minister David Cameron's Conservative Party. "The real danger for the government is not that they won't pass it through, but that it will be a policy fiasco," said Patrick Dunleavy, a political science professor at the London School of Economics. "By picking this fight with the student body ... the government seems to have gotten itself into choppy water." All of this has made Clegg one of the least popular politicians on university campuses. Protesters chanting "Nick Clegg, shame on you for turning blue" underscored the sense of betrayal, while the front page of the Daily Mirror newspaper called Clegg "the pathetic Pinocchio of politics." The deputy prime minister defended his decision to support the proposals, saying the plans represent the "best possible choice" during a time of economic uncertainty. "In the circumstances in which we face, where there isn't very much money around, where many millions of other people are being asked to make sacrifices, where many young people in the future want to go to university, we have to find the solution for all of that," Clegg told the BBC. Cameron's government describes the move as a painful necessity to deal with a record budget deficit and a sputtering economy. To balance its books, the U.K. passed a four-year package of spending cuts worth $129 billion, which will lead to the loss of hundreds of thousands of public sector jobs and cut or curtail hundreds of government programs. In response, the government modified its plan by raising the income level at which graduates must start repaying student loans and by making more part-time students eligible for loans.